GraphConnect SF: Innovate. Share. Connect. I’m super stoked for our conference and want to tell you why! GraphConnect, the highly successful graph database conference, returns to San Francisco on October 3 and 4, welcoming all graph database enthusiasts to explore new ideas, share innovations in graph technology, and make connections with researchers and developers from around the globe. This year’s GraphConnect SF will include four different tutorials (including two brand new ones! ), 20+ scheduled presentations, an unconference track, and a GraphClinic, all packed into two days. Neo4j, both standalone and HA. We’ll also show how to access your Neo4j deployment from IaaS, PaaS, and Web Sites, and walk through security best practices. In this session, we will explore the role of graph visualization in complex analysis projects such as national security, public safety, communication networks, and financial fraud. Now you can explore your data with Linkurious, a web-based graph visualization solution for Neo4j. We’ll see how everyone can use it to solve common problems like correcting errors, identifying patterns or finding and communicating insights. and the many other use cases and projects in the emerging graph database ecosystem! 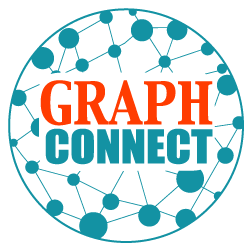 GraphConnect SF is the graph database conference, focusing on graph databases and applications using connected data. GraphConnect SF will be held at UCSF’s Mission Bay Conference Center. This year’s conference is on Friday, October 4 and the tutorials will run on Thursday, October 3. Register: Sign up soon since the Early Bird Pricing ends August 31. Submit a lightning talk: We’re running an unconference session featuring lightning talks at GraphConnect SF. If you have something interesting to present in 5 minutes, submit your proposal for a lightning talk. Tweet GraphConnect: Help spread the word! Everyone who posts an original tweet mentioning @graphconnect gets a printed copy of the Graph Databases book for free, either to pick up at the conference or at one of our offices. Just email us with a link to your tweet. See you in San Francisco in October!